Illustrated map of the route here: [web] [pdf]. Then the angel showed me the river of the water of life, bright as crystal, flowing from the throne of God and of the Lamb through the middle of the street of the city. On either side of the river is the tree of life with its twelve kinds of fruit, producing its fruit each month; and the leaves of the tree are for the healing of the nations. Second element = AIR - provided by education - the other hallmark of Cheltenham. 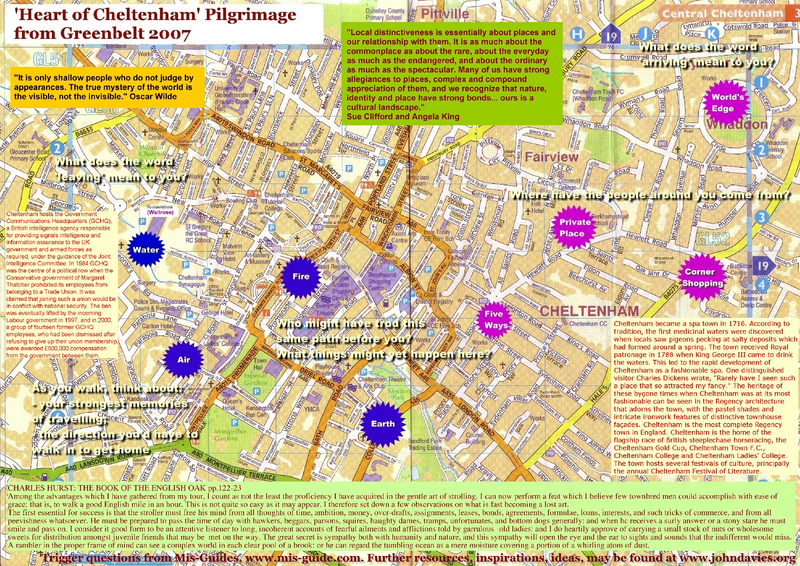 Cheltenham has numerous colleges notably Cheltenham College, Cheltenham Ladies' College, University of Gloucester / the air of a place of learning / draws many young people from surrounding areas. Forward to fountain @ corner of Promenade / Imperial Square - Neptune Fountain modelled on the Trevi Fountain in Rome - Edward Wilson explorer: camp statue. 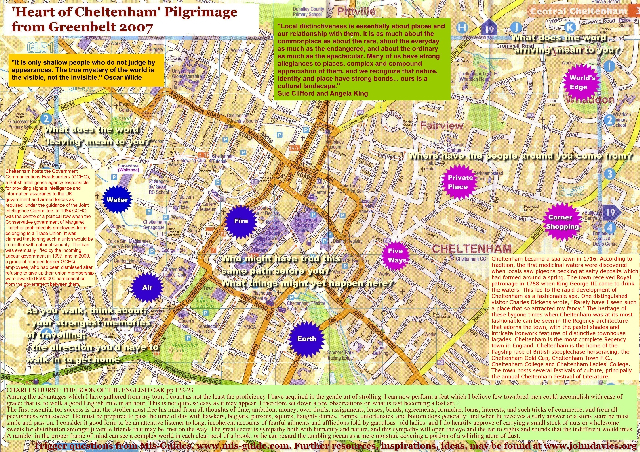 Plus festivals - Cheltenham is well known for being the home of the flagship race of British steeplechase horseracing, the Cheltenham Gold Cup, cricket festival, several festivals of culture, principally the annual Cheltenham Festival of Literature... and (proudly) Greenbelt. 'And to the angel of the church in Laodicea write: The words of the Amen, the faithful and true witness, the origin of God's creation: 'I know your works; you are neither cold nor hot. I wish that you were either cold or hot. So, because you are lukewarm, and neither cold nor hot, I am about to spit you out of my mouth. For you say, "I am rich, I have prospered, and I need nothing." You do not realize that you are wretched, pitiable, poor, blind, and naked. Therefore I counsel you to buy from me gold refined by fire so that you may be rich; and white robes to clothe you and to keep the shame of your nakedness from being seen; and salve to anoint your eyes so that you may see. I reprove and discipline those whom I love. Be earnest, therefore, and repent. Fourth element = Earth - a place of familiarity and solidity (as well as beauty) where people come to earth themselves; re-energise. A place of refreshmnent where people are closer trhan usual to the earth - sitting out in the elements, or on the grass, near flowing water etc. All urban places have places of refreshment at their heart if we seek them out. Nothing accursed will be found there any more. But the throne of God and of the Lamb will be in [the city], and his servants will worship him; they will see his face, and his name will be on their foreheads. And there will be no more night; they need no light of lamp or sun, for the Lord God will be their light, and they will reign for ever and ever. Explain that we now move into the roadside arm of the walk - leaving the River Chelt to connect at the end of the walk with some other rivers. As we walk we'll be aware of the flows of traffic and of people in the town and will think especially of these flows - the way people use the urban space, the lives they live, the forces which influence their lives & movement ... and try to link them to our own lives and experiences. Many urban areas have fiveways - complex juctions where different strands of the place meet. Here, routes from suburban areas meet 'student' routes, in a working-class district. Place of culture clashes - or equalisation - or creative collaboration? The road is a reminder of the fiveways in our own lives - the different strands which meet sometimes awkwardly, sometimes creatively, the different directions we take at different times, choices we have to make. Why are some spaces ours to use freely and others not? Who has decided these things and on what terms? Which spaces and places in our lives do we cherish as private and which do we celebrate as public? And why? Opposite end of walk to Waitrose - the anti-Waitrose, ie the local specialist shop - survives here. Continue up Windrush Road onto Clyde Crescent, walk clockwise to main Park entrance nearby. Clyde Crescent Doorstep Green. Look at sign on park entrance. Here they have helped to create a place of safety, a precious enclosed space of green for all to cherish and enjoy... as impressive in its own way as any of the great Regency park crescents in the town centre. Closing remarks - try this at home! Point towards resources on sheet.